elobeatlesforever (elobf) was launched in February 2009 to campaign for the release of the original, full 18-track version of ELO's seminal 1983 album “Secret Messages” including the elusive gem “Beatles Forever”. elobf has now expanded in scope to also include news on all things ELO, highlighting the connections with its progenitors The Beatles and The Move whilst also reporting on ELO's many incarnations, friends, relatives and interested parties. Hello ... Hello ... my old friends ... It's great to see you once again! You may remember the golden days of 7" vinyl when almost every single was "taken" from an album - or a forthcoming album. But did you know that ELO, via Jet Records, were parties to an unusual release as they approached their commercial peak? A large centered jukebox single taken from an EP which was taken from a boxed set of three earlier studio albums! After the amazing success of "Out Of The Blue" and the ensuing 'spaceship' tour, Jet Records released "Three Light Years" [JETBX1] in late 1978, a boxed set that included, of course, "On The Third Day" , "Eldorado"  and "Face The Music" . The famed ELO EP [ELO1] emerged from "Three Light Years" sporting four tracks: "Can't Get It Out Of My Head"; "Evil Woman"; "Ma Ma Ma Belle" and "Strange Magic" and managed to reach a respectable #34 in the UK Top 40 with an eight week chart run. Because the EP came in 45RPM format [and not 33RPM as reported by Wikipedia here] and because the stylii [or amplifiers!] 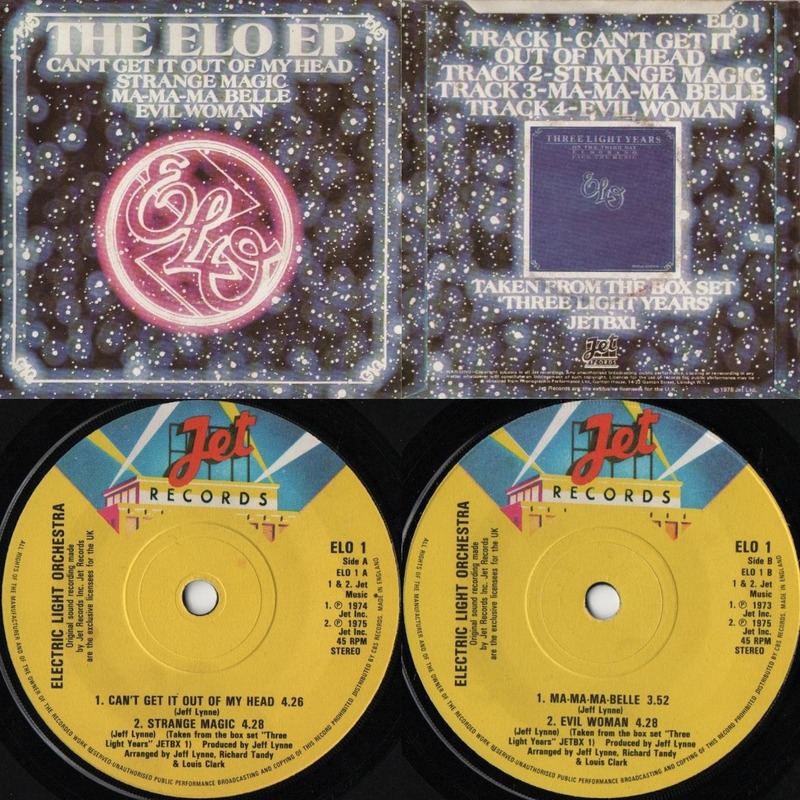 of then jukeboxes would not cope with what I term the 'fine groovery' that eight or nine minutes of playing time created, two tracks: "Can't Get It Out Of My Head" and "Evil Woman" were then "taken" from the EP for a special jukebox promo edition of the EP [ELO1JB]. I seem to recall that The Chart Archive quoted this rarity as attaining a chart position of #52 in its own right in early '79 [according to The Official Charts Company]. Never let it be said that being a collector of ELO and related items is uninteresting! A Second Secret Messages 7" Surprise!